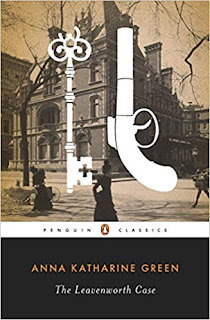 I was happy to realize that one of my Back to the Classics Challenge choices--the one for "A classic crime story, fiction or non-fiction"--would work nicely for the RIP Challenge as well -- The Leavenworth Case (1878) by Anna Katharine Green. This is another one that I've had sitting around for years. I think I even saw somewhere that someone thought it was boring and so I was worried about giving it a try. Now I'm just bummed that I put it off so long. This was THE first serial detective story, even before Sherlock. And, BONUS!, it was written by an American woman. The funny thing is that the serial detective is totally just in the background. The story is told by a young lawyer who becomes overwhelmed by the personalities of the two adopted daughters of a wealthy man who is murdered. He decides to investigate on his own, under the loose guidance of the detective Grice. What follows is a string of misunderstandings, misinterpretations, and surprises. I quite enjoyed this story! It honestly didn't seem like it was from 1878. It was well-paced, smart, and had some nicely developed personalities. I certainly wouldn't mind finding more books from Green. (She wrote something like 40 others!) 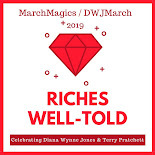 This was just her first novel and had the honor of being praised by none other than Wilkie Collins so I'm sure there are some other hidden gems out there. That's an interesting comment about the characters because in this one I was actually surprised by turns of events with a couple of the characters. They really weren't who I thought they were. I wonder why she got lazy.